So many of us are familiar with the story of David’s desire to bring the Ark into Jerusalem. Yet, truth to tell, aren’t we also puzzled by the consequence of his actions. How is it possible that such noble intentions meant to honor God and agreed upon by all the “elect” of the Lord could have resulted, not in glory to God, but in His total displeasure and even in a man’s (Uzzah’s) death? 1Chronicles 13 and 15 are chapters that deserve careful scrutiny lest we sin against the Lord ourselves in a similar manner and reap the same consequences. Yet there is more here at stake than our individual sins. It is, as it was in David’s time, the Body of Christ for which we must be concerned. The Ark of the Covenant represented the Presence of the Almighty God. The Ark had been captured by the Philistines through the irreverent actions of Eli’s sinful sons, Hophni and Phineas (1Samuel 2 and 4). When the Philistines captured the Ark, God’s people lamented that “the Glory had departed from Israel” (1Samuel 4:21-23). As long as the Philistines kept the Ark, sickness and plague abounded (1 Samuel 5). Eventually, the Philistines – a heathen people who worshipped idols – put the Ark on a cart and returned it to the people of Israel. Throughout his reign King Saul had little regard for the Ark nor for inquiring after it. The worship of Yahweh was diminished to such an extent that Saul lowered himself to seeking guidance from a medium, the witch at Endor (1Samuel 28). For forty years the Ark was neglected. 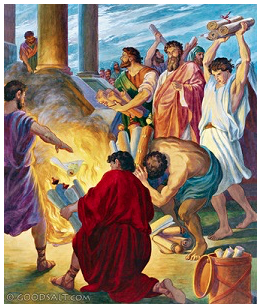 David wanted to bring it home to the new capital city as a sign that the Lord was once again in the midst of His people. His plans, however, went seriously awry. If we do not study the lessons contained in the following chapters, we place ourselves in grave danger. It was always the responsibility of all God’s people to be well-versed in His Word. Yet, these ordinances had been out of use for a long time “for [the people had] not inquired at it since the days of Saul.” The true worship of God had been neglected for basically forty years. However, in the midst of all these pious preparations, there was one serious problem. David said “if it is of the Lord our God.” No place does it say that David ever consulted with God even though he asked everyone else. If David had inquired of God, surely God would have reminded him to seek His Word on the proper method of transporting the Ark and it’s worship. All the people involved had the best of intentions for their actions. In fact, David was regarded as a man after God’s own heart. Yet good intentions can often be translated as driven by self, not the Spirit. The reasons why their plans to glorify God went so horribly awry are increasingly common in the body of Christ today. In the end, God, in His mercy, accepted their repentance and gave them a second chance to right their wrongs and He will do the same today. God had in His Word given specific instructions as to how the Ark was to be transported. He will never leave us ignorant of His Divine will if we seek it. Exodus 25: 12-15; and Numbers 1:50; 7:9 make it clear that the Ark was to be carried on the shoulders of the Levites, and only of one specific family of Levites, that of the Kohathites. These men were to be consecrated to the Lord and their responsibility to the Lord was a serious one indeed for what they carried was holy. Uzzah was a Levite but not of the family of Kohath. He was the son of Abinadab, in whose house the men of Kiriath-jearim placed the Ark when it was brought back from the land of the Philistines. The Ark had been brought by the Philistines in a cart (1Samuel 6:7). They were a heathen people, worshipping Dagon and Baal, not God’s chosen people nor well-versed in His commands. The Philistine’s ignorance was forgivable. However, God’s people should have known that to place the Ark, God’s most holy thing, on a cart – even a new cart – was against God’s specific command. Part of Uzzah’s problem may have been that he had grown too familiar with this “object” that resided in his house all those years. Perhaps the reverence was gone. You must keep all of My commandments, for I am the Lord. You must not treat Me as common and ordinary. Revere Me and hallow Me, for I, The Lord, made you holy to Myself and rescued you from Egypt to be My own people! I am Jehovah! Remember also that the worship of Yahweh had diminished to such a state during Saul’s reign that he was reduced to seeking guidance from the witch of Endor, a medium (1 Samuel 28). All in all, the reverence for the Holy Presence of God was at an all-time low due to a progressive period of gradual but deep disintegration. All this decline occurred in little more than a generation. Finally, when we arrive on the day of bringing the Ark into Jerusalem, all these sins accumulate. We see that as one sin led to another, death resulted. Yes, death. First we have the lack of adherence to God’s Word. Then we have the lack of consecration of Uzzah and his brother and their “familiarity” with the Ark. It mattered not how noble were their intentions nor how united they all were in their desire to please God. All that mattered was that God’s will was not obeyed in its fullness: He and His Word were not treated with the holiness of which they were worthy. If we are to truly please God, we must please Him in the way He has commanded, not in a way pleasing to us. No matter how outwardly “holy” it appears – if it is not according to His express commands, He will not receive it. Cain may have offered up the choicest vegetables in the garden, but it was only the bloody sacrifice that God would accept. So they carried the ark of God on a new cart from the house of Abinadab, and Uzza and Ahio drove the cart. Then David and all Israel played music before God with all their might, with singing, on harps, on stringed instruments, on tambourines, on cymbals, and with trumpets. So David would not move the ark with him into the City of David, but took it aside into the house of Obed-Edom the Gittite. The ark of God remained with the family of Obed-Edom in his house three months. And the Lord blessed the house of Obed-Edom and all that he had. And when Aaron and his sons have finished covering the sanctuary and all the furnishings of the sanctuary, when the camp is set to go, then the sons of Kohath shall come to carry them; but they shall not touch any holy thing, lest they die. “Lest they die.” Uzzah died. And David became angry with God (v.12). Did it not occur to David that God might have ample reason to be angry with him and all those who allowed this unbiblical action to occur? In other versions it states that David was “offended with God,” that he “blazed up in anger against God.” Does that idea terrify you? That puny man would let his anger blaze against the Creator of all things, the Savior of all men? Should David’s reaction not have been one of total humility under God’s mighty hand? They had good intentions – but were the intentions driven by self or by the Holy Spirit? There was unanimity – popularity is the more modern word. There was passionate singing - but, again, was the singing the excitement of the flesh or the anointing of the Spirit? They had a bright, shiny new platform for God, a new cart – but was that the Holy transport God commanded? David loved his God and venerated the symbol of His presence. He desired to restore the Lord's appointed worship, and to place the ark where it should be, as the most sacred center of worship. But right things must be done in a right manner, or they will fail. In this case the failure was sad for Uzzah died. Here were multitudes, "David and all Israel," and yet the business came to naught. Crowds do not ensure blessing. Here was energy: "they played before God with all their might." This was no dull and sleepy worship, but a bright, lively service, and yet... There was very little spiritual feeling! More music than grace. The priests were not in their places, nor the Levites to carry the ark: oxen took the place of willing men. The worship was not sufficiently spiritual and humble. There was no sacrifice. This was a fatal flaw; for how can we serve the Lord apart from sacrifice? I wonder that David did not notice this fatal omission, and I am not surprised that Uzzah died as there is no mention of the sprinkling of blood upon the mercy-seat that day. And, beloved, if we leave the blood of atonement out of our worship, we leave out that which is the very life of it. As Spurgeon highlighted, we have eminently good intentions, conducted with the total agreement of the people of God, with praise abounding, and yet disaster ensues. The result: God was displeased, Uzzah died and David’s anger delayed the entrance of the Ark into Jerusalem by three months. Verse 12 states that David was afraid of God. Fear is the result of sin. Down deep inside David knew he had done something wrong. He felt guilty. Yet, this was a man who truly loved God and his subsequent actions would show that. Wonderfully, God would speak from His mercy seat and give David and all the people a second chance. This time they would follow God’s Word to the letter and that would make all the difference. Yet before we discuss David’s and the people’s repentance, God’s blessed mercy and the glorious outcome that unfolds in 1Chronicles 15 there is one other sober topic that needs to be covered and that is this: How do all the errors of 1Chronicles 13 relate to the church at large today? There have been many reasons listed why Uzzah didn’t have to die. He was a man not appointed by God to carry the Ark, but he meant well. He may actually have thought he was doing God and the people of Israel a service. After all, he was doing what he had been told to do by the people, despite the fact that he had not been told by God. He had had instructions from the authorities on his responsibilities, so he obeyed. Yes, there might have been the teachings of the Levites from long ago coming into his remembrance about the proper method to carry the Ark, but everyone else thought it was such a great idea. It was so popular. Who was he to disagree? And that reluctance to stand up for God’s Word – everyone’s reluctance – resulted in his death. How often are we in the church guilty of the same – remaining silent because it isn’t popular to object? Remember how Satan deceived Eve by saying that she really wouldn’t die if she just disobeyed God’s Word in one small way (one “new cart” way)? And Satan was right wasn’t he? Eve did not die… or, at least, not physically. Yet her and Adam’s entire relationship with God died. There were no more walks together with God in the Garden of Eden, no more sweet communion. Instead there was sin and separation and expulsion. Yes, there was death, it just wasn’t visible. So when the “new cart” comes in, death will follow, the death of true communion with God. What a heartbreaking thought. Remember the symptoms of the Uzzah Syndrome? They had good intentions – but were the intentions driven by self or by the Holy Spirit? There was unanimity – popularity is the more modern word. There was passionate singing – but, again, was the singing the excitement of the flesh or the anointing of the Spirit? They had a bright, shiny new platform for God, a new cart – but was that the Holy transport God commanded? Observe how these symptoms play out in today’s world. “The new cart” – the method of the unbiblical Philistines – is the physical evidence of the whole problem in 1Chronicles 13. It comes under the guise of bringing in new ideas mixed in with God’s Word. Most often it is found in new books – usually the most popular books, praised by all the reviewers. The error tries to hide under its popularity, its mixing of the heathen with the Biblical by saying it is a new way to pray or become closer to God. Sadly, as in David’s time, even those in places of spiritual authority who know the Word of God, as the priests and Levites did in David’s time, may keep silent as to its lack of agreement with God’s Word. Because the authors of the works do indeed seem to be so well-intentioned, and have a heart’s desire to be of assistance to those they are writing for, the errors in the books are overlooked. The people who read the books seem blessed; therefore, more books of the same character are written. There is, however, one other similarity to 1Chronicles 13 that cannot be overlooked in this picture: What are God’s thoughts on the matter? Is the content of the book in agreement with His Word? If they are not, are we faced with another spiritual death? Yet entire books are written based on these “new cart” premises, many of them highly “popular,” just as popular as the new cart in David’s time. When someone tells you to consult mediums and spiritists, who whisper and mutter, should not a people inquire of their God? Why consult the dead on behalf of the living? Consult God’s instruction and the testimony of warning. If anyone does not speak according to this word, they have no light of dawn. More disturbing to me, as a former Catholic, is the steady influx of Catholic influence into today’s church. For example, St. Ignatius Loyola was a Jesuit who received his “visions” for the spiritual disciplines from the Virgin Mary. These disciplines have been translated into the modern-day Spiritual Formation programs that are being presented in what were once conservative churches. I know of a family where the Spiritual Formation director shared a practice in “imaginative meditation” that she had recently learned at a Catholic monastic retreat she had attended. Suspecting nothing, the congregation followed her lead as they “imagined” Jesus in their presence as He “healed” them. There is no chapter and verse for this procedure. Wonderfully, mercifully, there is Chapter 15 after chapter 13: God granting a second chance after repentance. Look at the complete turnaround as David and his people recognize their sins and repent of them! And so it was, when God helped the Levites who bore the ark of the covenant of the Lord, that they offered seven bulls and seven rams. 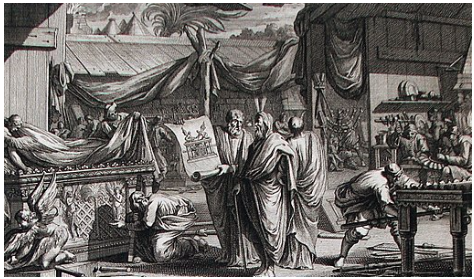 Though it was with the best of intentions, the desires of David and the people to bring the Ark into Jerusalem initially failed. However, because David sought the Lord out of a tender heart, he learned from his mistakes. During the three months the Ark stayed at Obed-Edom's house, he had plenty of time to relive his sin and its tragic consequences. We can also infer that he spent those months praying, confessing, inquiring of the Lord, and searching the Scriptures (v. 13). David’s first clue might have been that the three months the Ark was at Obed-Edom’s house, the house and its occupants were blessed. Obed-Edom was a Kohathite. The blessings were occurring because the Ark was finally in the right place! David had clearly learned from his mistakes, and much was done differently this second time around. The Ark was carried properly, on poles. Priests and Levites were used more correctly. Their repentance resulted in God’s giving them a second chance. Their humility of heart ensured the success of that second chance. God was pleased and glorified. And many who had believed came confessing and telling their deeds. Also, many of those who had practiced magic brought their books together and burned them in the sight of all. And they counted up the value of them, and it totaled fifty thousand pieces of silver. So the word of the Lord grew mightily and prevailed. Like all of those gathered with David who wanted to bring in the Ark to Jerusalem, the people here were believers. In verses 11-12 of this chapter there is a description of wondrous miracles and healings taking place in the Name of Jesus. Ephesus was a center of occult practices. Therefore, while the Ephesians had been converted to the Lord, they still had not parted with their occult practices. The encounter with the sons of Sceva in v. 13 -17 convicted the Ephesians that the Name of Jesus was the most powerful Name, worthy of honor and worthy of exclusive adoration. So thoroughly convicted were they that they gathered their heathen books and burned their books in the sight of all. Yes, it cost them a great deal to part with their books. But look at the Heavenly profit! True revival comes from repentance and a renunciation of sin. By obeying the conviction of the Holy Spirit and abandoning their involvement with the “mixed” books, the Christians made a path for revival and a great evangelistic effort came about. That made it worth it. I will share with you a true story of the glorious results of the principle of “burning books” to rid ourselves of the mixture of unclean practices with the holy. It was truly awe-inspiring to be a part of and humbling to watch as God moved among His people. My husband and I took our niece back to her house and went home. To our surprise, we were greeted by the sight of our entire living and dining room filled with the same teens we had just left. They needed to talk and pray some more. Finally, we called it a night. After all, we would see each other for our usual Sunday School class only one day later. But it didn’t turn out to be our “usual” Sunday School class. On Sunday my husband and I were greeted by a large garbage can as we entered the room and the same group of teens with all their secular rock music tapes in bags. They had gotten together on Saturday and decided to bring all their tapes in to completely dispose of them. Into the large garbage can went the tapes as the teens requested we take them all home and burn them! Incredibly, the Sunday School Superintendent made a surprise visit that day. Her reaction to all this was total joy. In addition, we were asked by the teens to not just have a regular Sunday School each week but also a weekly Friday Bible Study group that would meet in our house. They were so hungry! The story does not end there. The following Friday some of them brought their unsaved friends. A young man we will call Tim came. The second week Tim and four of the other boys disappeared halfway through the Bible study and went to the outside porch. Unexpectedly, my son called me out there because Tim was acting “strange.” When I saw Tim, I agreed. I went to touch him to pray for him and he totally changed. These horrid, blasphemous phrases came out of his mouth in the most disturbing guttural voice. In addition, he could not be held down and was violent. Tim weighed about 130 lbs. and the four guys could barely hold onto him. I certainly didn’t know what to do, but God certainly did. All that came to me was to repeat the Name and Blood of Jesus over him as the boys held him. After about five minutes of this, we brought Tim inside, explained what was happening to the rest of the group and the others present joined us in prayer. Tim’s face throughout this was very distorted. It was like looking at the face of evil. During this entire time, there was no fear among any of us. One of the boys present received a Scripture from the Lord and somehow we knew that when these awful guttural sounds stopped, we would have the real Tim back. We kept pleading the Blood and Name of Jesus over Tim and about five minutes later, he blinked! Then he smiled and spoke like Tim. Yes, all these teens saw this. What was their reaction? A few months later one of the girls present (Mary) was diagnosed with leukemia. Remember, this was 35 years ago when leukemia was basically a death sentence. This group of teenagers elected to pray and felt the Lord lead them to the story of Jairus’ daughter. We laid hands on Mary and prayed in obedience and faith to the Word given. Mary’s thoughts on the matter were very simple: we’ve seen there is a devil, but we know Who’s stronger. For the next two years Mary kept running, and winning, in her track meets. I’m not done... As the two years went by these hungry kids went on to receive baptism. Those who were saved, at their request, went to the base chaplain for instruction on water baptism and we all watched as they – including Tim – got baptized in the Pacific Ocean. How did all this begin? They burned their tapes. I look back and I think of Acts 19: 18-20. The people heard the simple yet oh-so-powerful Word of God and humbled themselves to the convicting power of the Holy Spirit to such an extent that they “burned their books.” That’s all it took – following the express Word of God. Yet how many today are operating with “new carts,” with new ways to pray, new ways to hear from God, new methods that mix in the religions of modern-day Philistines with true Biblical Christianity? Uzzah was a victim of a system like that and it cost him dearly. David and all the people were so sincere in their desire to please God. God knew that. That’s the reason why 1Chronicles 15 is in the Bible. It’s God’s second chance. Once David acknowledged that the problem was all his fault, he repented and went back to obeying only what was written in God’s Word. No additions, no subtractions, no mixing with other religions – just the holiness of His Word. That’s always been enough to please God and produce the results He – and we – want. The question must finally be asked: what are the “new carts” – or even more explicitly the heathen or occult books – that need to be burned? Contemplative spirituality books, Jesus Calling, Circle Maker, Primal, Whisper, books with references to Catholic mystics, any others...? In the months to come we will make mention on my blog of some of these books that mix the holy and the profane. Prove your books according to the Bible (1Thess 5:21: Prove all things: hold fast that which is good) and God will bring to light what is not in conformity with His Word. If we truly want “the Word of God to move mightily and prevail” (Acts 19:20), we must rid ourselves of the “new carts” and burn the books unpleasing to the Lord. 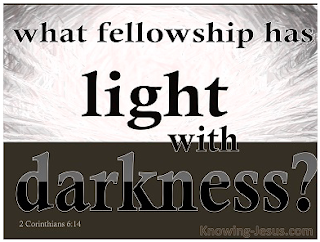 If we let one beam of light in, all the power of the Holy Spirit will burst forth after it. “Building the Ark of the Covenant” By Philip De Vere [CC BY-SA 3.0 (https://creativecommons.org/licenses/by-sa/3.0)%5D, from Wikimedia Commons. “David Brings the Ark to Jerusalem” by Darlene Slavujac, 1993. Original oil on 24″x36″ canvas. Copyright 1993 Slavujac. Gilley, Gary. “‘Biblical Discipleship – Prayer’ by Dr Gary Gilley (Part 1).” The Narrowing Path, 23 Mar. 2014, thenarrowingpath.com/2014/03/20/biblical-discipleship-prayer-by-dr-gary-gilley/. Barbara Wilhelm, a longtime member and supporter of the Discernment Research Group, has recently been publishing discernment information at her own blog at https://holdinghiswordhigher.com. Permission to republish this article on the Herescope blog is granted by the author. Minor editing and formatting changes were made to her original. Read her previous article series on Herescope, "Another God, Another Jesus": Part 1, Part 2, Part 3, Part 4.